OLYMPIC FINALIST. SWISS NATIONAL CHAMPION. COLLEGE GRADUATE. 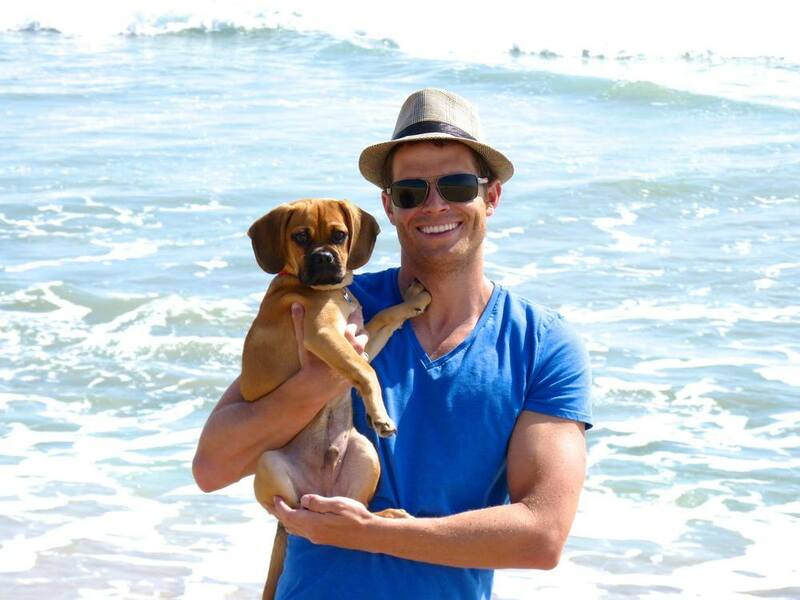 Dominik with dog Duke in the Pacific Ocean, off the coast of Long Beach, CA where Dom and his wife Jessica Hardy reside. To say that Dominik Meichtry has travelled the world would be an understatement. Given his father’s profession (with Swissair), Dominik was fortunate to have grown up in a number of different countries and as a result has been exposed to different environments and cultures. With destinations including Athens (Greece), Kinshasa (Formally Zaire), Los Angeles (USA), Hong Kong (China) and Johannesburg (South Africa) Dominik has developed into a knowledgeable citizen of the world, so to speak. Having learned how to swim as a precautionary measure in his backyard in Kinshasa, he picked up his love for the water on the beaches of Manhattan Beach, CA. It was here that his early development led Dominik to where he is today as the best swimmer in modern Swiss swimming history. Dominik’s success didn’t come without obstacles along the way. In 1999 while on a skiing trip in Verbier, Switzerland, he broke his hip and was told he would never be able to compete competitively again. Dominik did not let this stop his drive to the top. After a recovery time of almost 2 years he returned to the pool with more focus and determination to succeed and prove the critics wrong. Five years after his accident Dominik participated at the 2004 Olympic Games in Athens where he made it to the Semifinals (14th overall) in the 200m Freestyle and was the youngest competitor behind the great Michael Phelps. After the 2004 Olympics he had a decision to make and that was to stay at home in Switzerland or go abroad to the place which started his swimming journey and that was California. After being recruited by various NCAA Division 1 universities, he chose the University of California, Berkeley which had a track record of working with other international swimmers, a top ranked swim program as well as one of the United States’ finest academic institutions just outside of San Francisco which boasts a great cultural experience for a foreign student. During his time at Cal he proved himself as one of the best middle distance Freestylers in the world. After winning the prestigious PAC-10 Newcomer of the Year Award, it didn’t take long before he establish himself in the collegiate scene. Dominik currently holds 8 Swiss National records, and has won more than 20 National titles. As a graduating senior at Cal, Dominik qualified for the 2008 Olympic Games in 3 Freestyle distances and became one of only 4 Swiss swimmers ever to reach an Olympic Final & the first since 2000. After graduating from UC Berkeley, Dominik moved to Los Angeles with his girlfriend (Jessica, who is on the US National Swim Team) and became a member of Trojan Swim Club where he trains today with his sights on Rio 2016 after competing for his home nation of Switzerland at the 2012 Olympic Games in London. Training in the US allows Dominik to train and compete against some of the best athletes in the world. Dominik flies back to Switzerland multiple times a year for international competitions as well as spend time with his family who reside in Rorschacherberg, Switzerland. When not in the pool, Dominik enjoys going to the beach, cooking, watching movies and spending time with Jessica and their puppy at their residence in Long Beach. They got married in October of 2013. Today, in 2014, Dominik remains in training shape, but has not decided upon continuing his road to Rio as a swimmer or a Swiss broadcaster bringing the action back to his homeland.